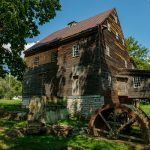 The Breneman-Turner Mill is the oldest surviving, fully equipped, pre-Civil War gristmill in Rockingham County, Virginia. 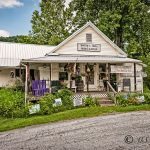 It is located on Turners Mill Lane at the junction with Breneman Church Road about 3.4 miles north of Harrisonburg. One of the first settlers in Rockingham County was Adam Miller, a German native who was living near Williamsburg. He followed the trail of the Knights of the Golden Horseshoe into the Shenandoah Valley in 1727. Miller moved his family down from Lancaster County, Pennsylvania. This started a migration of Mennonite settlers of German descent from Pennsylvania into the Shenandoah Valley including the Breneman family. 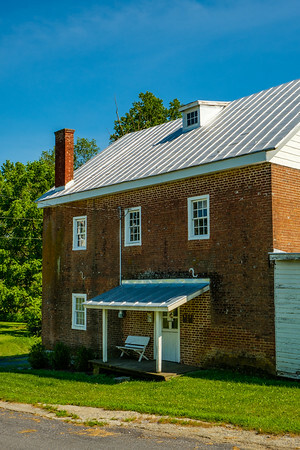 The two-and-a-half story, brick mill was built circa 1800 for Abraham Breneman. 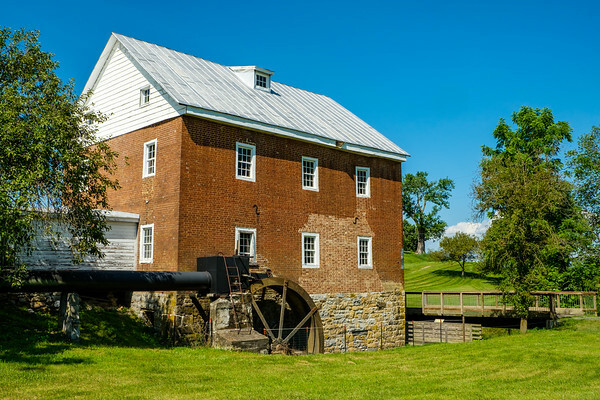 The Federal style building is unusual for a mill in the Shenandoah Valley as most of them like Lantz Mill and the Andrew Zirkle Mill in Shenandoah County to the north were of timber construction. The mill has a limestone foundation and basement walls. The walls of the first and second floor are brick with a timber interior structure. The walls are five bricks thick where it meets the basement and three bricks wide at the roof-line. 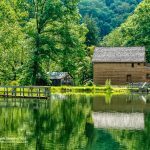 The mill was originally powered by water from a mill pond which took its water from the nearby Linville Creek. The water was then delivered to an “under shot” water-wheel via a millrace. The millpond was washed away in a flood in the early years of the 20th century. The millrace was subsequently connected directly to Linville Creek allowing an adequate waterflow for the mill to continue to operate. The water wheel was replaced with the current 16-foot “over shot” wheel in the 1920s. The mill was one of the only mills to have survived General Sherman’s two-week Valley Campaign to end the Shenandoah Valley’s role as the “Breadbasket of the Confederacy”. The Union Troops set fire to a vast numbers of mills, barns and other farm buildings in what became known as “The Burning”. On October 6, 1864 the soldiers arrived at the mill, which was owned at this time by George Shaver. Shaver was seriously ill, so it was up to his 77-year old wife, Hannah, to try to stop the destruction of their property. Although sympathetic, the soldiers had to follow orders and set fire to the mill. As soon as the troops left, Mrs. Shaver was able to put the fire out with a broom. Embers from the fire at the nearby barn which had also been set alight by the Union soldiers, set the mill on fire again. Mrs. Shaver was able to summons help from a neighbor, Jacob Wenger who was able to extinguish the fire. The mill ceased operations on Turner’s death in 1988. The Turner family donated what has now become known as the Breneman-Turner Mill to the Valley Brethren-Mennonite Heritage Center in 2003. 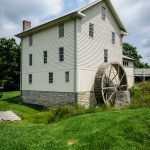 The Center is restoring the mill and have re-opened it for grinding demonstrations. 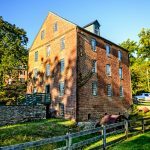 Befitting a building that was central to the local economy and which has maintained its integrity for over 200-years, the Breneman-Turner Mill was listed on the National Register of Historic Places in April 2006. In 2010, it was added to the Shenandoah Valley Battlefields National Historic District as a Civil War tour site. 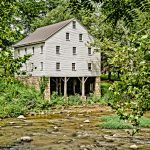 The Breneman-Turner Mill is the oldest surviving, fully equipped, pre-Civil War gristmill in Rockingham County, Virginia.